On my latest journey to Ireland, I made it a point to visit Dalkey Castle, also known as Goat Castle for its flag of arms it flies. My trip and photo journal were enriched by the history, lore, and sights at this castle which is nestled in the middle of the town of Dalkey. 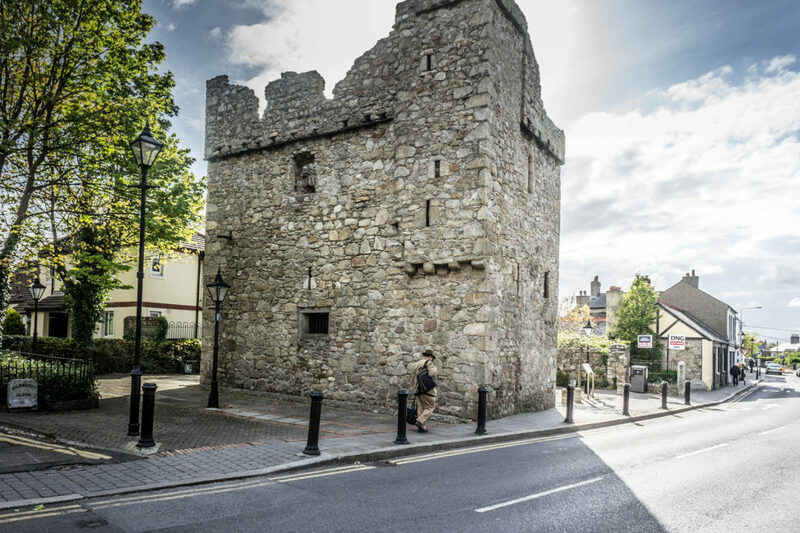 Dalkey Castle may seem small from the outside when compared to some of the larger castles in the country, but the tour is what makes it worth your time and small entrance fee. The tour lasts about 45 minutes to an hour long and consists of historical accounts of the castle by actors who portray various figures who would have lived and worked in the castle. The head guard and his slightly drunken (and comically quirky) guardsman start the tour by giving you a general overview of the castle. They discuss the historical setting, means of business, fortification and life of a guard. As it was a transitional story tour, the Lord of the castle approached the group (which for our tour was about 12 people), scolded the guards for their slothfulness, and took over the next section of the tour. He led the group up a narrow set of stairs, past the murder hole (a hole directly above the main entrance of the castle, used to pouring boiling oil, water, urine, rocks, etc, onto enemy raiders) up to the main dining hall. At this point the Lord passed us off to the head servant. The head servant’s hands were constantly busy as she gave us her spiel about the chores, duties, and tasks required of her and the other servants to keep the castle operational. Although the work seemed downright wretched, every task had its purpose in sustaining the castle. As this castle is positioned near the Irish Sea, it served as a drop-off point for many goods which would later be transported for resale. This was the castle’s main source of income, and thus a defending force was essential to its survival. After hearing about the other functions of the servants, the head guard gathered us for a trip up to the roof. He talked about the lay of the land and how the castle defends itself. We gained perspective on how far an archer could strike an enemy as they approached. We did have to use our imagination a bit, as there is a modern town surrounding the castle now. From what is left of the ramparts, we could see where the ships would land and unload their precious cargo, which would be carted up by pack animal to the castle and stored. Looking out towards the water we could see Dalkey Island. Ships would come between the island and the mainland for safety from pirates and storms alike. I was disappointed that the tallest part of the castle was off-limits, most likely due to eroded stone, or perhaps they were found to be loose. Either way, it would have been an even better view. In medieval times, spotting an enemy approaching early had a dramatic effect on a castle’s preparedness and fighting effectiveness. After seeing some of the weapons used for defense, we were finally led down to the bottom floor where we were passed off to the final actor in the tour. She explained that she was the widowed wife of a Scottish stoneworker who had recently died in the nearby quarry. She and her eight children now scraped by as their main source of income had disappeared. The tour ended shortly after and we went on our way. The tour gives an audience a great overview on how life once flourished at Dalkey Castle, and why its history is worthy of study. I would highly suggest a visit to Dalkey Castle should you be traveling around Dublin. Make sure to take plenty of photos as it is a very fun tour to tell your friends all about.